STILL WAITING FOR THE SPARK - Unlike the Tea Party Movement last year, the Occupy Wall Street Movement (OM) has not flown so far, and seems to be dying asphyxiated in the filth of its own encampments. What is happening? Despite the freedom, complacency of authorities, full support of the media and complicity of sectors of the establishment that the movement has enjoyed for the last nine weeks, OM has reached a turning point. From now on, either it changes from larva into a moth or it disappears. In terms of propaganda, the bold occupation of Wall Street as a symbolic anti-capitalist protest calling for an end to the mega-money of banks and stock markets was an intelligent blow. That example was taken up by similar groups in the main cities of the country and some few abroad. But no other intelligent action followed. I would say that the sorcerer inspiring that first dramatic act fell asleep or lost the formula for his potion. He has not provided his followers with most of the essentials needed for a movement to fly. The Occupy Movement has no symbols - banners, logos, songs, dress styles - like the hippies or the Black Panthers in the ‘60s. It has no ideas like the students of Berkeley and the Sorbonne (May ‘68), who followed the philosophy of Marcuse and Levy Strauss. It has no articulated economic-political agenda like Hayek’s Neo-Liberalism, which it pretends to replace. It has no charismatic leaders such as Red Rudi in Germany, Cohn Bendit in France or the mysterious Subcomandante Marcos of the Zapatista guerilla in Mexico. It does not even have a cluster of three or four spokespersons, like the Islamic terrorism, to claim responsibility for their attacks. The consequence of these shortcomings is unavoidable: Without leaders, ideas, agenda and symbols, no movement can attract, convince, expand or last. On November 22, some OM partisan posted on the Internet a Wikipedia page doing its best to paint it in a favorable light. Even there I found none of these defects remediated. In the present day atmosphere of economic depression, where the bottom layer of the American middle class is sliding into poverty and the situation of the lower class worsens with each passing month, we have a cultural broth propitious to demagogues and preachers of change. It seems to me that, taking its first steps, OM briefly caught the attention of these two classes, which stopped to listen to what it would say. The Occupy Movement, however, articulated nothing that could attract them. The imaginary claim that OM represents 99% of the American people - a poor imitation of the Tea Party’s catchy slogan ‘We the People’ - was not enough to polarize the general discontent. Its economic “demonstration” of the supposed 99% it represents on its Wikipedia page is unconvincing. I believe that OM plus its supporters do not represent even 1% of the American population. In short, regarding public opinion, OM is on the brink of completely missing a golden opportunity. 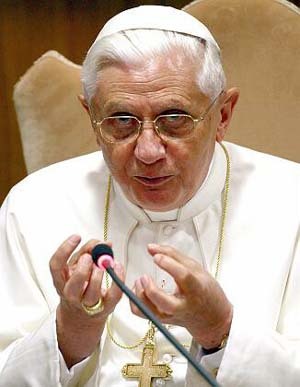 In an attempt to capitalize on the general economic dissatisfaction, Pope Benedict XVI launched his Encyclical Caritas in veritate in 2009, telling the nations to abandon Capitalism and unite under a global socialist government. In case this appeal were disregarded, the pontifical document encouraged class struggle against the capitalist establishment. The entire progressivist wing of the Catholic Church is eager to support OM as much as it can. Once again, the OM’s inspirer so far has not shown the ability to take advantage of this enormous potential. When a revolutionary movement sprouts, normally one can track its origin. This was the case with the rebellion in Berkeley, the Black Power here in the U.S., the Landless Movement and the Christian Base Communities in Brazil, etc. There is always a traceable history of a movement’s steps of growth and how it surfaced in the public arena. In OM, however, there is nothing of the kind that I know of. Wikipedia tries to fill this gap, but in an unconvincing way. It attributes the initial idea of occupying Wall Street to the Canadian group Adbusters, which publishes a web-magazine: Nothing else. From that vague initial point, how did the protesters organize themselves to start a street movement? It is not said. Whoever has any practice in analyzing public demonstrations knows that they do not occur spontaneously, as OM pretends. Street movements need a central command to coordinate them, direct their public appearances, orient them ideologically, provide solutions for the unpredictable problems that appear in their contact with the public, and organize them logistically - food, lodging, money, health and hygiene. But OM does not want to reveal its command. It only admits Skype meetings among its members and chaotic “general assemblies” at the end of the day in each encampment to decide its future. A beautiful tale that pretends to be reinstalling direct democracy… Hence, OM is hiding its head and structure. Why? Is it because OM is promoted by the government to divert attention from its failures? By the banks to create an atmosphere that allows them to change their own system? Or by the Communists to test their strength, an augmentation of their recent street manifestations in Wisconsin? Van Jones visiting an Occupy encampment in L.A.
Time magazine revealed a part of the behind-the-scenes leadership with a recent article (November 21, 2011) on Anthony Jones aka Van Jones, former Obama “green czar,” his special advisor on the environment. 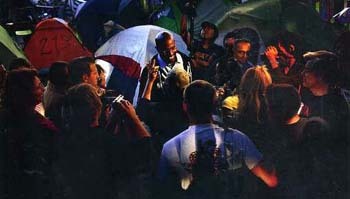 The article showed how Van Jones is deeply involved in the Occupy Movement. According to Time, Jones has been speaking at the encampments in New York, Boston, Los Angeles and San Francisco. He raised a coalition of 70 “liberal” organizations to support OM intellectually and financially; he organized a petition with 350,000 signatures asking New York Mayor Michael Bloomberg not to evict OM. He also is behind the American Dream Movement and Move Your Money website, both having strong ties to OM. Since Jones is a known communist and continues to be a close friend of Obama, we may say that the questions raised above are partially answered. The movement is being directed by communists to the benefit of the Obama administration. But why would Time, a leftist magazine, only now feature a known Marxist as the mover and shaker behind OM and suggest that it is communist? It confirms to me that the movement is showing death symptoms and, while OM is still breathing, Time wants to credit Van Jones for organizing the whole movement so that after OM disappears, he will be its spokesman in the future. Is Time telling us the truth about OM – that Jones is indeed the head behind the movement? Or is it just inflating his role to create an American Fidel Castro for the future? As it continues to lose its hold over public opinion, OM is attempting more aggressive and destructive moves, such as the occupation of the Oakland Port on November 2. There is a difference between passively sitting in front of a stock market building and actively preventing an important port from operating. The first is a pacific protest that harms almost no one; the second causes the country a substantial economic loss and can be included in the genre of communist class-struggle. Provoking the police in order to reap a "martyr"
Entering this type of action, OM abandoned its Gandhi-style modus operandi and adopted a more radical communist method. Other actions it has undertaken seem to fit the same line, such as taking over supermarkets in Los Angeles on November 17 in an aggressive violation of private property. Why this change? Is it to provoke the police to use violence and create a victim, a “martyr”? In many places, when a strike or a protest loses steam, it looks for a “martyr” to reignite its flame and surge ahead with new impetus. I wonder if this is the answer. Another important change regarding OM comes from the establishment: Everywhere the police are closing the encampments or moving them in the name of public order and hygiene: The beautiful urban parks where they are camping are being destroyed and transformed into filthy drug spaces. 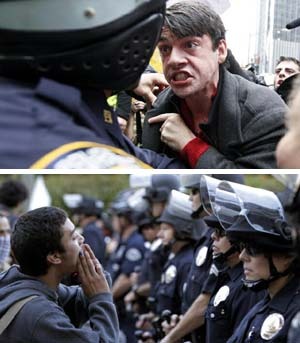 Will the Occupy Movement disappear? Will the camps be transferred to other sites in order to receive an “official status” with rights recognized by law and financial support, like the Los Angeles authorities are proposing? Will the movement reignite and destroy the establishment, led by Van Jones? Will it just be hijacked by the red unions for their routine demands? We have to wait and see. I only know that without a new spark, this movement cannot fly by itself.